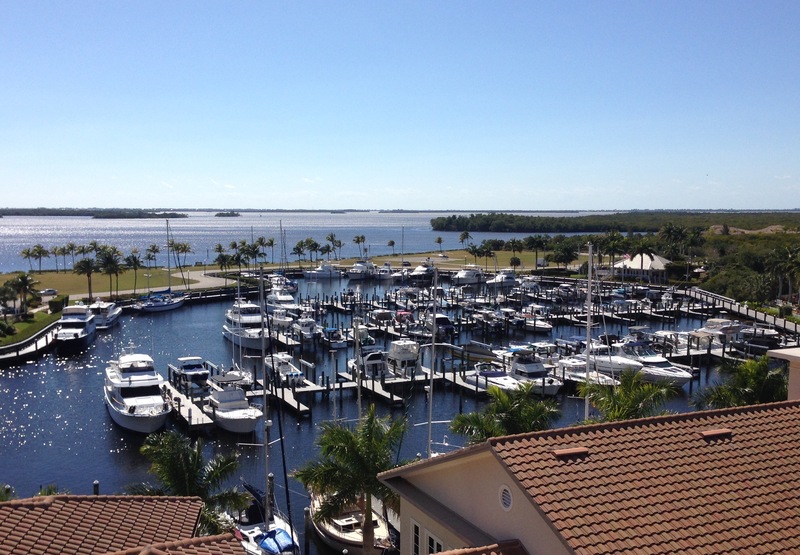 Tarpon Point Marina in Cape Coral has been our home for the past three weeks. The Marina is very nice with brand new floating docks. This resort is part of the Tarpon Point development consisting of three twelve story condos, several boutique shops, and a 20 story Westin Hotel. There is also an extensive gated community of residential homes along the canals. The highlight of our stay was reconnecting with friends. 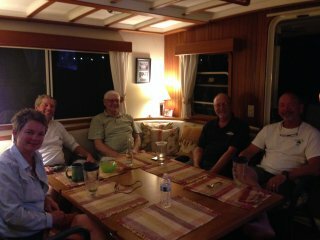 Our main reason for staying here was to visit our good friend Dean who lives in Cape Coral and keeps his 70 ft. Hatteras here at the Marina. We first met Dean four years ago while in Grand Haven, Michigan. At that time, Dean had a boat in the slip next to us at North Shore Marina. Jeff helped Dean bring his Hatteras, Carry On, from Newport to Cape Coral several years ago and we have become good friends. An added surprise was getting to see another Michigan friend, Uncle Al. Al was also our boat neighbor in Grand Haven, MI. and is down visiting with Dean. Two days after our arrival, our good friends, Marty and Suzanne, aboard the Krogen sister ship,Alizann, anchored 300 yards behind us in Glover Bight. They just crossed Lake Okeechobee from Stuart and came by to say hello. It was good to get the two boats together again. We last cruised with Alizann on Lake Superior in 2010. They have become special friends. We have traveled with them to Antartica and also chartered a catamaran together in Baja, Mexico. To celebrate this great gathering of friends, we have a seafood feast aboard Idyll Time one evening. It was indeed a special occasion to have everyone together. The next day was also special as Dean decided to take his Hatteras , Carry On, out for the afternoon. Marty and Suzanne joined us for the boat ride. Carry On is a gorgeous 1996 Hatteras. Dean has spent the past two years doing many upgrades to her. She is a beautiful yacht and Dean is rightfully proud of her. Another highlight of our stay was visiting with Robin, Dean’s long time girlfriend. She is a school teacher in Michigan and flew down over the weekend for winter break. We enjoyed several days of bike riding, boating, and great meals together. It was wonderful spending some quality time with Dean and Robin. We had some other excitement here, but not the good type. Three days before our scheduled departure, we took Idyll Time over to the fuel dock to top off our tanks with 250 gallons of diesel. While doing so, we noticed that our backup depth sounder was not working. A phone call to Scotty, our electronics guru, was made and a new depth sensor was shipped overnight. 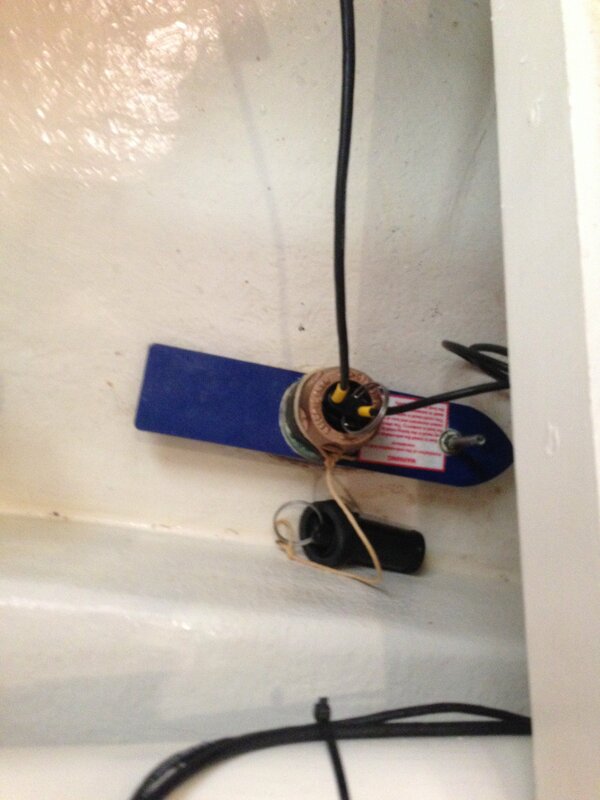 The only complication is that this sensor is a thru hull sounder. We have two options, the safer one being to haul the boat out of the water to replace the sounder. The other option is to replace the sounder in water. The danger here is briefly having a 2″ hole in our hull with water pouring in. There are several boat yards about nine miles away that would be happy to haul us out for $500. While waiting on the sounder to arrive, we make a phone call to Dave, a local marine electronics technician with 27 years of experience. 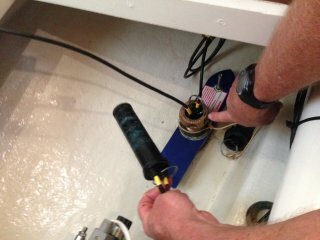 He exudes confidence and assures us that replacing the sensor can be done safely while in water. He has done many of them with no problems. The sensor is shipped overnight to Dean’s house and Dave is there the next morning to install it. As a backup, Jeff has his scuba gear ready on the back deck in case there is a problem during the sensor switch out and has to dive over to plug the hole. There are a few tense moments as Dave pulls the old sensor and quickly exchanges it with the new one. No more than a few cups of water escape into the hold. With the new sensor in place, we can again relax as things are again back to normal aboard Idyll Time. 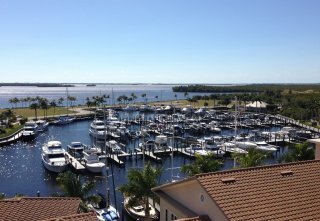 We have had a great stay here at Tarpon Point but we are starting to get dock fever and it is time to head south. 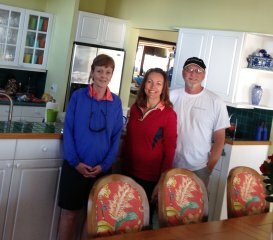 Tomorrow we will leave for Marco Island where we plan to meet up again with Suzanne and Marty aboard Alizann. 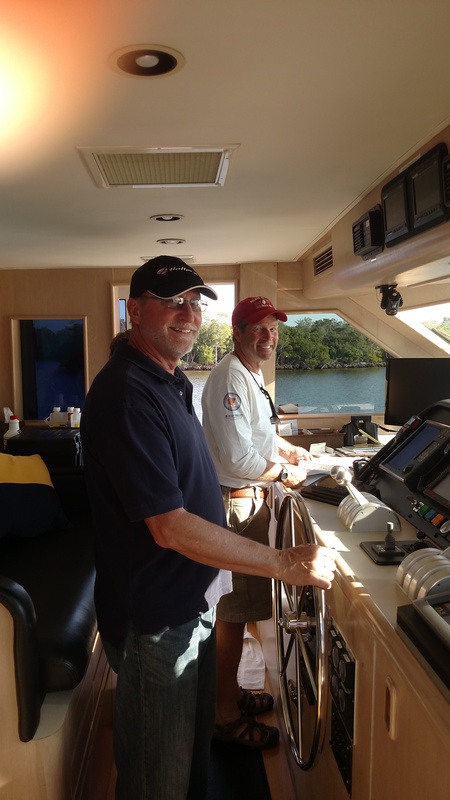 We are looking forward to cruising with with them through the Everglades and Keys. This entry was posted on February 28, 2015 at 4:37 pm. You can follow any responses to this entry through the RSS 2.0 feed. You can leave a response, or trackback from your own site.